One of the newer Climate Smart Agriculture programs in California is the Alternative Manure Management Program (AMMP). The program was launched by the state in 2017 to support dairy and livestock operations in their efforts to reduce emissions of methane, a potent greenhouse gas. Administered by the California Department of Food and Agriculture (CDFA), AMMP provides financial assistance to dairies and other livestock operations that want to transition away from anaerobic or wet manure storage and handling to dry manure storage and handling or improved pasture-based management. CalCAN advocated for the creation of AMMP to assist dairy and livestock producers in addressing methane emissions along with other water and air quality concerns on their operations. The program was developed following the 2016 bill, SB 1383, that requires the dairy and livestock industries to reduce their methane emissions by 40 percent by 2030. In a state with over 1.7 million dairy cows, AMMP has great potential to decrease short-lived climate pollutants (SLCP) like methane, which accounts for 6% of the state’s emissions and has significant climate-warming impacts. From 2017 to 2018 AMMP awards more than doubled, from 18 dairies in 2017 to 39 dairies in 2018. AMMP is better suited than anaerobic digesters (another technology fix for methane emissions) to fit the needs of small and mid-size dairies, which do not produce enough manure to merit investing in a dairy digester, a technology that costs between $1,340 to $3,400 per cow. Part of the reason why AMMP can benefit a wider range of dairies is the program’s flexibility. The program funds a variety of practices, all of which can accommodate herds of varying sizes and do not require the same capital investment as digesters. 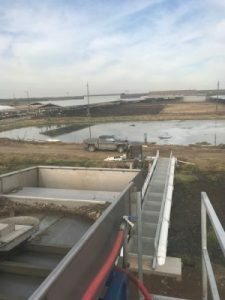 Each alternative manure management practice aims to divert and capture manure solids before they reach the anaerobic environment of a storage lagoon. The solids can then be dried, composted, or spread, increasing agronomic opportunities for dairies. 57 percent of projects implemented solid separation, 25 percent flush to scrape, and 18 percent composted bedded pack barns. 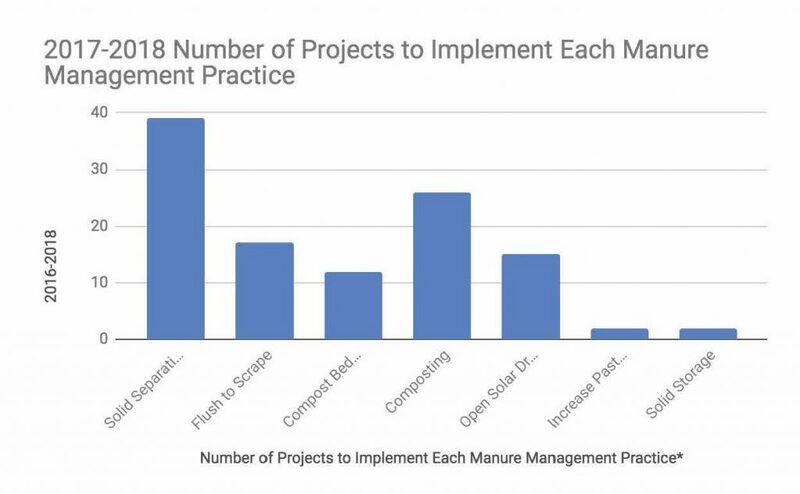 Two-thirds of the AMMP projects include composting of manure in their projects. Dairy and livestock producer demand for the program is high. In the 2017 application year, 53 dairies applied to the program and 18 received grants. 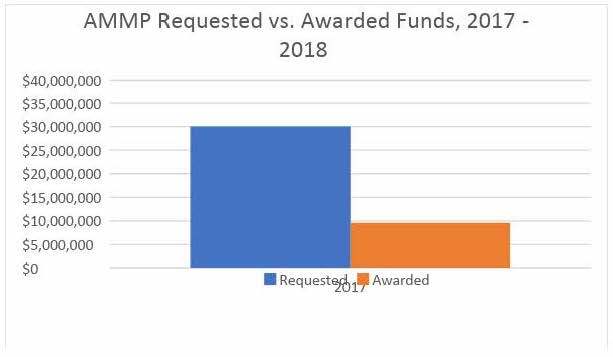 In 2018, producer demand for the program was high again with 63 applications to the program and only a bit more than half (39) AMMP projects funded. AMMP awards increased from $9.6 million in 2017 to $21.3 million in 2018. All five of the leading milk-producing counties —Tulare, Merced, Kings, Stanislaus and Kern —which account for 72% of the state’s milk production, received AMMP funding in 2018. AMMP funds also reached counties with smaller diaries, like Sonoma and Humboldt. AMMP has funded projects in 13 counties, compared to Dairy Digester Research and Development Program (DDRDP), which has funded digester projects in only six counties in the Central Valley. AMMP’s GHG reduction estimates for the grants made in 2017 and 2018 for five-year projects combine to equal 711,382 (MTCO2e over 5 years), representing a significant step towards accomplishing GHG reduction goals. CalCAN is advocating that AMMP receive its own budget line item in the upcoming Greenhouse Gas Reduction Fund (GGRF) budget, the cap-and-trade funding source for these Climate Smart Agriculture programs. Currently, CDFA receives funding for Dairy Methane program work and the Department determines the funding split between AMMP and the DDRDP. AMMP has received just a little more 20 percent of those funds, despite considerably higher producer demand for the program. We are also seeking $40 million for AMMP. Unfortunately, Governor Newsom has proposed only $25 million for both AMMP and DDRDP.